Rotorua is a city in the Bay of Plenty region of the North Island of New Zealand. The area is a major destination for both domestic and international tourists; the tourism industry is by far the largest industry in the district. 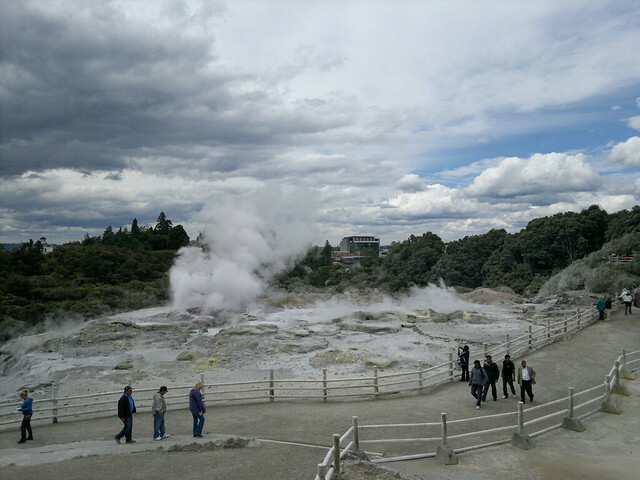 Thermal activity is at the heart of much of Rotorua’s tourist appeal. Geysers and bubbling mud pools, hot thermal springs and the Buried Village so named after it was buried by the 1886 Mount Tarawera eruption are within easy reach of the city. In Kuirau Park, to the west end of the central city, hot bubbling mud pools dot the park. Visitors can soak their feet in hot pools. Rotorua has the nickname Sulphur City, because of the hydrogen sulphide emissions, which gives the city a “rotten eggs” smell, as well as rotten-rua combining its legitimate name and the rotten smell the city gives. The especially pungent smell in the central-east ‘Te Ngae’ area is due to the dense sulphur deposits located next to the southern boundary of the Government Gardens, in the area known as ‘Sulphur Point’. Rotorua is also home to botanical gardens and historic architecture. Known as a spa town and major tourist resort since the 1800s, many of its buildings hint at this history. Government Gardens, close to the lakeshore at the eastern end of the town, are a particular point of pride. Another of Rotorua’s attractions is mountain biking. Whakarewarewa Forest has been described as ‘the Disneyland of mountain biking’ and includes mountain bike trails, where the UCI Mountain Bike and Trials World Championships were held in August 2006.